After a surprisingly pleasant flight, which arrived 45 minutes early, we picked up our rental car and set off for Leon. Google said 3 hours 25 minutes, but we made it in just under 3 hours, thanks to moi. Leon is a lovely small city, with a charming old center. Our hotel, the Posada Regia, is right in the heart of it, and has the old world charm combined with modern conveniences, that make it a 3-star. It is an incredible deal at 50 euros a night. The hotel also houses a restaurant, Botega Regia, where we immediately settled down for a wonderful traditional lunch. Obviously popular with local businesspeople, it was busy this afternoon, though not filled to capacity. We had garlic soup and smoked tongue to start, then tripe stew and stewed pigeons (2) for mains. Both came with delicious fried potato cubes (even I, not normally a fan of potatoes, was impressed). A nice bottle of 2013 Bierzo red, the wine of this region, was only 13 euros. Total bill was 73 euros. Charming atmosphere and attentive service made this a great meal. After lunch we took a stroll around the old town, stopping at the magnificent cathedral, the much simpler basilica, and the various plazas. We wanted to get some Pedro Ximenez sherry, the very sweet cream sherry we love so much, and our hotel directed us to Casares, a small wine store that has a very nice selection. We picked up a bottle of 2008 from Albala, which we are drinking as I write this. At 14 euros, it is a great buy for vintage sherry. 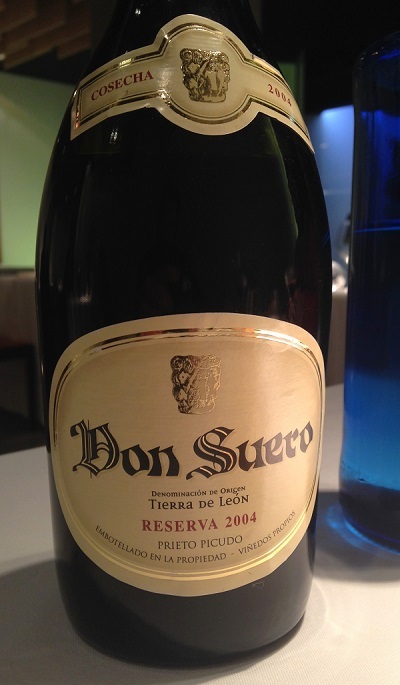 We also bought a bottle of Don Zoilo non-vintage for 9 euros, which we will try tomorrow. 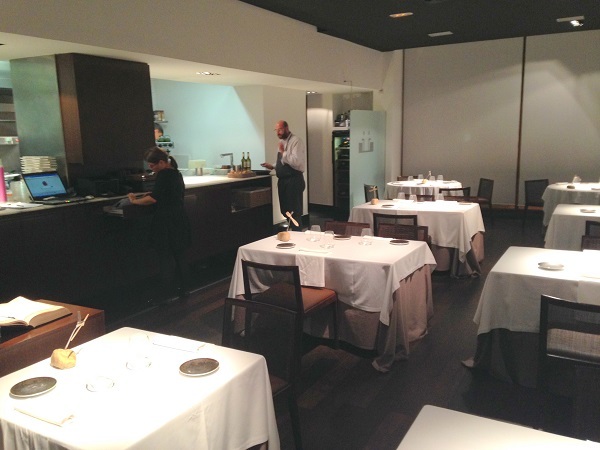 Dinner was at Cocinandos, a Michelin starred restaurant on the edge of the city center. This was absolutely incredible. Ten tables, simple but elegant, the chef/owner and a couple of cooks, one server, and obviously a lot of passion for food and wine. The only choice is a tasting menu consisting of 6 courses, for 40 euros, and we chose to have the wine pairings, which were a mere 16 euros apiece. The cooking is innovative and beautifully plated. The wines were all from the region (Bierzo), and included a white, a rose, and a red, perfectly matched to the food, and a muscatel dessert wine. This was a truly memorable meal. It is incredible that all of this cost only 113 euros. Below is the menu, and next to it the English translation, which comes from Google translate, and is rather comical. 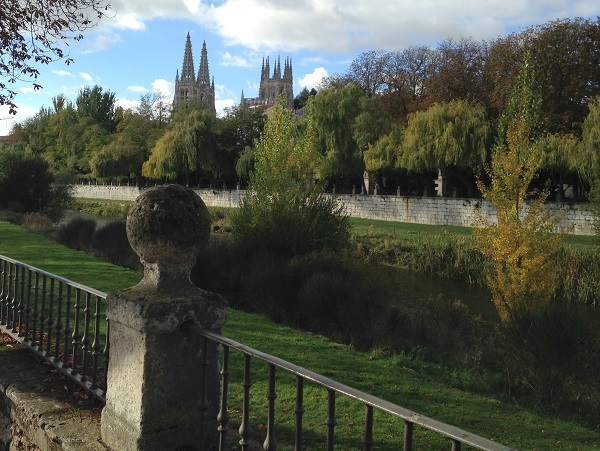 On Friday, we took a day trip to Burgos. 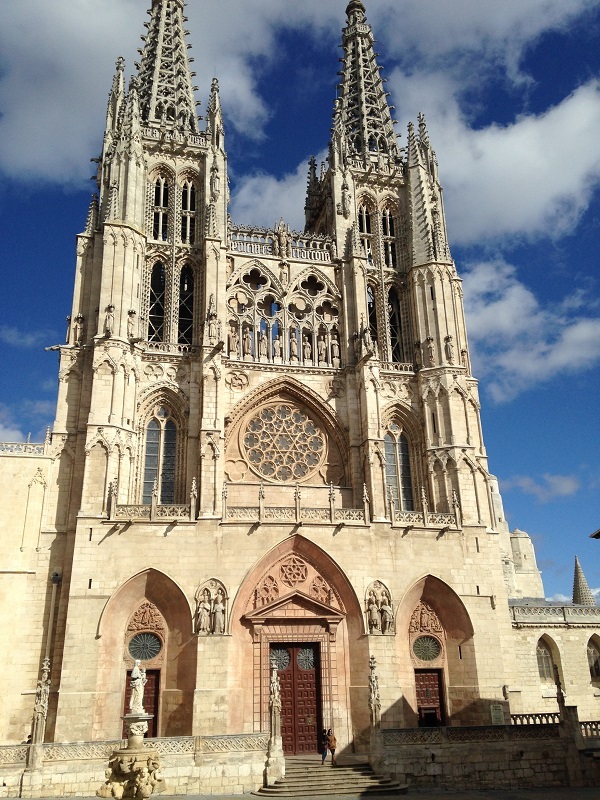 We toured the old city and the magnificent cathedral, which was probably the grandest we have ever seen. It’s not the biggest by any means, but the stone carving, plaster work, painting and gilding, and the stained glass are all over-the-top. As we strolled around the town with our trusty Guide Michelin, we checked out various restaurants, and settled on Casa Ojeda, which has a bar and delicatessen on the ground floor and a formal restaurant one flight up. The decor is charming and traditional, as is the food. We both started with the pickled partridge salad, a regional specialty seen on many menus. Their version was top-notch. I then had the roast suckling lamb and Stanley the confitado of suckling lamb cutlets. Both were superb, as were the scalloped potatoes served alongside. A bottle of Ribeira del Duero 2010 was only 18 euros, and my coffee came with delicious mignardises. 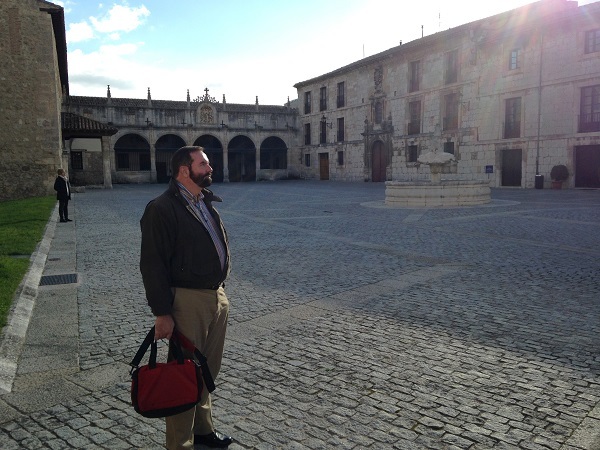 After lunch, we headed to the Real Monasterio de las Huelgas, on the outskirts of the city. With interiors that are much grander and less austere than the typical monastery, it was a very interesting tour. Eleanor of Acquitaine brought her daughter, also Eleanor, to Burgos to marry the Castillian King, Alfonos VIII. The monastery was Alfonso’s gift to his wife, and the two, who both died in 1214, are buried in double caskets that sit in the center of the Royal choir. The guide was obviously very knowledgeable and passionate about her subject, eliciting chuckles from her Spanish visitors, though with our rudimentary Spanish we could only pick up snippets of the narrative. 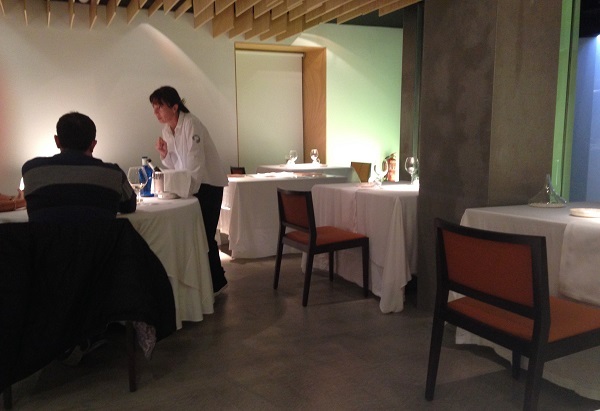 Back in Leon, we had dinner reservations at Pablo, a very new restaurant that, like Cocinandos, offers an impressive looking tasting menu, in a similarly spare and modern setting. The food turned out to be comparable in quality with what we had the previous night. 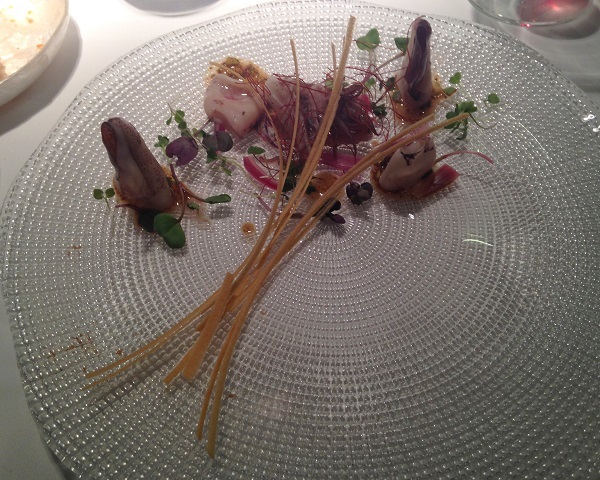 The plate pictured below is squid, just barely cooked, with pork belly. They do not offer wine pairings, but we were very happy with the one shown below, a local wine (note that it is a 2004 Prieto Picudo reserva) for less than 20 euros. 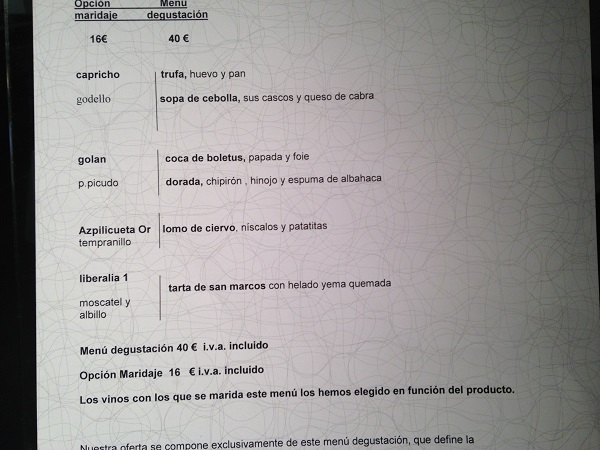 The entire bill, including water and one coffee, was 99 euros. Perbacco is not a place that had been on my radar, but when I received an offer from Blackboard Eats, I looked for reports on Chowhound, my most trusted source for dining info. I found a few positive mentions, but with little detail. Yelp reviews, which I find less credible, were almost unanimously positive. It seemed worth taking a chance, and turned out to be a fine choice. There were 3 of us so we got to taste a number of dishes. Our appetizers were swordfish carpaccio with oranges, grilled octopus salad, and creme brulee of parmigiano reggiano. The creme brulee was an unusual and delicious dish, with a balsamic glaze. The octopus was tender and flavorful, and the swordfish worked very well with the orange. Main courses were chicken scallopine with taleggio and truffle oil, trippa alla Romana, and ravioli. All were interesting and tasty, and the tripe had a nice spicy kick to it. We finished off with a wonderful prune armagnac gelato and orange hibiscus sorbetto. Decor is warm and cozy, service was excellent, and they have a nice selection of Italian beers, which we appreciated. The menu is quite extensive so there will be lots of dishes to try when we return, which I look forward to.